The philosophy and politics of the Divergent series have never really made any sense, but that would be forgivable if the future dystopian setting were used for thoughtful metaphor. It’s not; not by a long shot. Wheezing into the third film based on the YA novels by Veronica Roth, the franchise has been nothing but a string of reveals that do nothing to give depth to the story or its characters and a series of anticlimaxes that serve only as a bridge to the next movie and mean little once that next movie begins. Allegiant does nothing to change that cycle and is perhaps has the worst case of placeholder syndrome with a series of events presented so blandly it feels that even though we get a ton of laborious exposition, nothing really happens. And whatever does happen doesn’t mean anything. The last film, Insurgent – a few years from now it will be interesting to see if the layman could tell you the order of all the “—ent”s and “—ant”s, I know I won’t – was all about opening a box that contained a secret message. 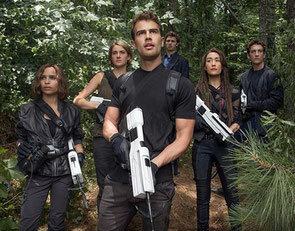 They got the message, and thus Allegiant picks up with the characters debating and acting on its contents. So, Tris (Shailene Woodley), her beau Four (Theo James), her brother Caleb (Ansel Elgort), and pals played by Zoe Kravitz and Miles Teller finally have an opportunity to escape the walled city of Chicago and discover what’s on the other side. Efforts are made difficult, however, by Evelyn (Naomi Watts), who’s filling the leadership vacuum left by the ousted despot played by a nearly comatose Kate Winslet in the first two films. Instead of moving the city into a promising new era, Evelyn oversees the executions of the former regime and butts heads with respected pacifist Johanna (Octavia Spencer). Tris and crew escape Evelyn’s henchman and scale the wall in one of Allegiant’s mystifyingly bad action sequences: They discover Evelyn has electrified the wall. It’s a good thing Tris happened to bring a bomb just in case. It’s also a good thing the transformer that apparently controls the current for the entire wall is located about 20 yards from where the group decided to cross. Then, BOOM!, they’re over. Discovering a nuclear wasteland, the rebels are rescued by the Bureau of Genetic Welfare and its leader David (Jeff Daniels), who has been observing the Chicago “experiment.” He informs Tris that her genetic purity is the key to saving the world. From there, there’s lots of explaining about the true nature of future-world Chicago, the bureaucracy that left the Earth scorched, and the new bureaucracy that’s replaced it. The narrative gets in the way of any color, with Daniels reduced to expository mode while Woodley and James are left to stare pensively with trepidation. Woodley looks just as bored with the material as the audience at this point. None of the conflict is palpable on any level. Of course there are secrets kept by Genetic Welfare and the movie actually acts like this would be a surprising development. There are token romantic rivals thrown in for Tris and Four – Bill Skarsgård and Nidia Hikler, respectively, that never feel like a threat to the central couple. Even the nature of the film’s title is totally underplayed. “Allegiant” refers to an emerging resistance against Evelyn’s rule in Chicago, but it’s mentioned off-handedly just once, but magically in the ridiculous climax, Tris, Four and everyone else appears to know exactly what it. For all of its explaining, the writing consistently fails to fill in necessary gaps and just plugs away, hitting the most basic of necessities to retain the minimum amount of rationality. Double-crosses happen out of the blue, and characters just seem to know what to do innately. The only moments with any life in Allegiant are a conversation with Teller and Daniels that’s playful and entertaining, and the action scenes highlighting James and Kravitz, who both show the requirements to be physical heroes. It also helps that they get to use these cool multi-purpose disc drones that can map environments and be used as shields, among other things. Some of that stuff is pretty neat. But the action and the narrative lack coherent vision, figuratively and literally, with some pretty shoddy effects for a big budget franchise. The lackluster conversation and combat lumbers to a trumped-up, ludicrous finale that, again, lacks oomph. For all the allusion to government corruption and greed, surveillance, etc., beating down and categorizing individuals, Allegiant doesn’t go beyond a corny message of standing up for yourself and fighting back. It’s trite even for the intended young adult audience.